I’m Australian (actually Anglo-Italian by birth), I was fortunate to read Riccardo’s piece and was riveted from beginning to end. I myself had not known the story of Peter Norman; I don’t recall anyone ever discussing it. So Riccardo has done a great service to me, personally. I had no time to translate it into English, but you have done such a sensitive, masterly job of it than any attempt of mine would have been lame. So I am deeply grateful to you as well, Alexa Combs Dieffenbach. Ti ringrazio di cuore. Such a sad and tragic story, where once again an apology and acknowledgement arrived much too late. “The white man is perhaps the biggest hero”? Are you taking the p**s? Is that meant to be a joke? This is really Sad. He should be remembered too. From Spain… Great post. Thx. this was an interesting article- but i have to say, this line “Thanks to an old article by Gianni Mura, today I discovered the truth: that white man in the photo is, perhaps, the biggest hero of that night in 1968.” I get your sentiment, but it’s a bit strange to call the relatively unknown white guy who empathises with the people of colour the biggest hero in a picture which is specifically about the people themselves showing solidarity in a time of struggle. It reads like White-Saviour. There is a reason his arm isn’t up- he knew, in that moment it wasn’t about him. He suffered for it and I value his efforts. I’m glad and interested to learn about him and my complaint may seem pedantic or unnecessary, but calling him the biggest hero kind of defeats the point. Firstly, thank you for this article. I enjoyed reading it. It paints Australia in a light I have never thought of. The country I live in is far from perfect, but may surprise you in its embrace of many cultures and nationalities. “Apartheid” is not a word I have ever heard applied to it before. I wonder if Peter Norman’s shunning had more to do with him making a political gesture at a civil event, rather than what the gesture itself meant. Great story of a true hero. Thanks. You missed the part where one of the American runners had forgotten his gloves, rather than do it sans gloves Norman suggested they wear the one pair and hold up different hands. I can’t remember where he said it, it was in an interview a long time ago… it’s been at least 10 years since I studied it for some subject or other however I also recall that he said he ran so fast because the track had a brand new and very bouncy synthetic track and he trained on grass. Put the man on the statue and tell people this story. It’s as simple as that. Hopefully, when you are at SJSU, you can ask the university to add Mr. Norman to the statue because he surely deserves to be there. Maybe even start a petition to add him to the statue. This way the university will learn of the support and add him. What an amazing story and thanks for bringing it to everyone’s attention. One thing though, as an Englishman, I’m surprised you thought of him as ‘just a simpering Englishman’ whatever you think of Englishmen, he is clearly wearing the Australian kit. Thank you so much for teaching me about this story! However, I think it mischaracterises Australia in 1968. In 1967, 90.77% of (white) Australians voted for “Act to alter the Constitution so as to omit certain words relating to the People of the Aboriginal Race in any State and so that Aboriginals are to be counted in reckoning the Population'” which effectively ended the treatment of Aboriginal people as inferior by Government. What didn’t change was certain bastions of conservatism, and I doubt that the Olympic Committee of many countries would be held up as a shining light for freedom. Nevertheless, he was a great figure, and the two black athletes also acted with a dignity and inclusiveness that shows the Olympic committees of both countries for what they were (and perhaps still are). It just goes to show, when you get up the nose of those in authority, you are in for a bumpy ride. Thank you for your article! I migrated to Australia from Argentina 37 years ago and have loved this land and its people ever since I arrieved with my family as a youth. I find this story sad but at the same time very moving and inspirational. Sometimes people can become blinded by what is popular rather than what is right. Ironically it seems that (in a distorded kind of way) those who fought and defended equality in the USA have become the aggressor (the bullied becoming the bully). 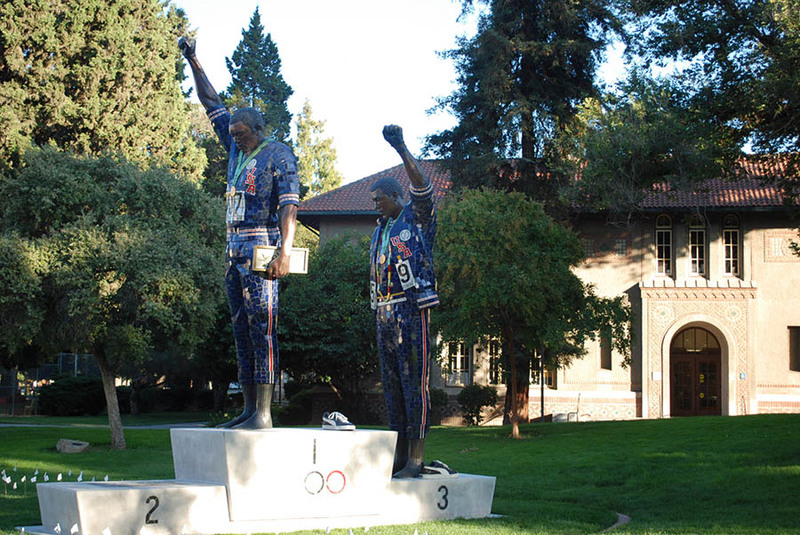 I fear that the absence of Peter Norman (today) from that podium at the San Jose State University reveals the cruel reality of continued inequality among people in America. By omitting a true supporter of the course of justice and racial equality (at that pivotal moment in sport’s history) just because he was a “white Australian man” shows me that the band players may have swapped places but the music is still the same! Please, do not take this comment the wrong way for I too have always supported social and gender equality but it pains me to see what Peter Norman had to endure from both sides of the struggle just because he could see beyond the “colour” of their skin while many of those on opposing sides of the argument after so many years still can not see! I am humbled by this story. Thank you for sharing this. Awesome article Alexa! Great story of true human unity and common struggle. So tired of the divisive rhetoric that is hamstringing the progressive social justice movement today. The original article says that before they went to the podium Smith and Carlos realised they only had one pair of gloves, and that Norman suggested they take one each. Thank you, and thanks to all of these brave men. A great article. Its disgraceful that Norman was left off of the statue. I’m glad to know that he finally received his due. I am Australian and I have always enjoyed Peter Normans story. In fact we studied him in Australian History as he was a brilliant figure. If only his name was more widely recognised. Perhaps we need an addition to that statue. Peter deserves his step. Informative read. In honor of his participation, perhaps, one day, Peter Norman will be added to that empty space on the sculpture. Wow! Never knew this. Quite a story! Thank you Chuck Bentjen. We’ve corrected the error now. Yes Jetjag, you’re right. We intended “each”. We’ve corrected the word. Thank you. I have heard Peter Norman’s story before, but enjoyed reading it again. Great article. I can understand why Norman was omitted from the statue, and of course why many would wish him to be added to it. I personally would add a plaque to the 2nd place podium explaining who Peter Norman was, but leave it empty. That way visitors can take a moment to stand in his place and take a little time to reflect on his experience of that historic day. I profoundly disagree. His companions on the podium went on to work in tandem with others in the emerging Civil Rights campaigns. He had to deal with his struggles alone, and yet stayed true to his values all along the way, because it “wasnt about him”. I”m sorry you cant see the heroic in such a gesture. Thank you for this powerful and heart-breaking article. I well remember the 68 Olympics protest but like everyone else, I never knew about Peter Norman. What a truly great man! I’ve read elsewhere that this space is intended for others to be able to stand there. While the statue may not represent the man, it presents space for the eternal gesture he committed to that day. If we know the history of that moment, instead of staring at the man, cast in bronze, we can contemplate the immortal gesture of solidarity that the man committed that day, and stand in his place. I emailed San Jose State University with a link to this article to suggest it. I went to college at SJSU and participated in Legacy Tours that tell students and adults about the story and legacy of Smith and Carlos statue. I was told that the 2nd place podium (Peter Norman’s spot) was left blank so that anyone who wishes to stand with these men can do so, just like Peter did. So much strength and honor is represented, and after reading your article, I hope Australia does something to honor their man too. And Alexa, if you make it to SJSU, the tours are amazing but the statue is breathtaking! Has absolutely nothing to do with the story. Actually, the only people that ostracised him were his fellow Australians, who at that time were engaged in their own segregation. So sorry there are no 2 sides to this coin. Whites were simply aghast that he had the temerity to understand the struggle. Wow! I have Never heard of him, or his story. I salute you Peter Norman. All three of those men ran an amazing race. What a great video. I agree with the others commenting here; calling the white guy “perhaps the biggest hero” is pretty messed up in this context. 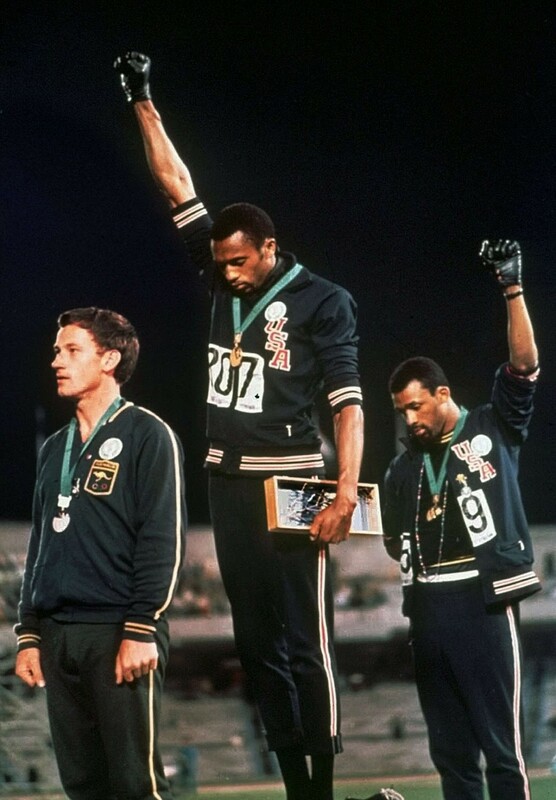 Credit where due: Peter Norman acted with tremendous integrity and solidarity, and we owe him great respect. But the story shouldn’t be about him. I agree with this point. In 1968, when a lot of white people were condemning Smith and Carlos, there was little or no mention of Norman. But now that they’ve been proven to be on the right side of history, let’s not only mention the white guy, but call him perhaps the biggest hero of that night. I also agree that this was not the intended point by the writer of the article, but this is more than just pedantic, perception matters too. 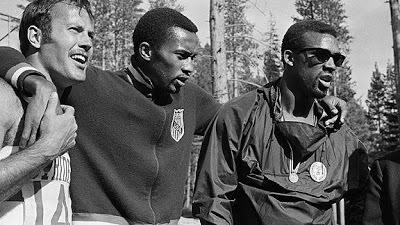 The story of Peter Norman, his struggles, sacrifice and honor can be celebrated without comparison to Smith and Carlos. They are all heroes. I agree he was definitely a hero, I wouldn’t say that he was the biggest hero but rather an equal. I saw the actual incident on TV and remember it well. I only heard the story of Peter Norman’s involvement a few years ago. It is sad that he is missing from that statue but in a way his absence makes the statue even more poignant. So much disinformation in one article. Also, the level of discrimination in Australia wasn’t even remotely close to the extreme racism of Segregation-era America, let alone Apartheid South Africa. Why ruin a perfectly good story with these kind of bare-faced lies? No-one is saying this man isn’t a great guy. But why commodify his actions as being greater than those of two men who raised their arms in anger. Maybe he should have raised his too? Actually, many people suffered “alone” during this particular time in history- many communities battled for their right to be seen & respected. Yes, Norman made a great, incredible move by standing in solidarity, but are you able to understand the greater purpose behind the gestures and movement of ALL THREE athletes at that time? Before we pass the hero crown off to Norman for doing what’s right, maybe you should take some time to really learn & understand the significance of this moment in history. This was an excellent piece. However, I have to ask- why do you consider P. Norman to be the “true hero” of this moment for doing what’s right? The aboriginals in America were treated just as badly and there has been no apology. If you were ever to teach in a Metro school you could see what bullies the culture has created. Unfortunately a lot of it is fueled by hatred not a desire for fairness. I also enjoyed the anecdote but why do we white people always have to make sure to centralize the story of other white people? “…the biggest hero of that night”…seriously? I don’t know why some are offended that Norman is being called a ‘hero’ in this article. Do you feel like calling him a hero takes away the struggle and the work black people have put into their cause? Are we that fragile and insecure? Smith and Carlos celebrated his life and honored his death. The actual 2 people who were there with him at the dais see him as a hero. We should too. It doesn’t make us less in any way. I’m Australian and I want to thank you for the story. I was only 13 and involved with athletics in 1968. I knew what the gesture meant at the time and I was mystified by Peter’s suspension because his gesture seemed so low key. I had no idea about what happened to him afterwards, until now. 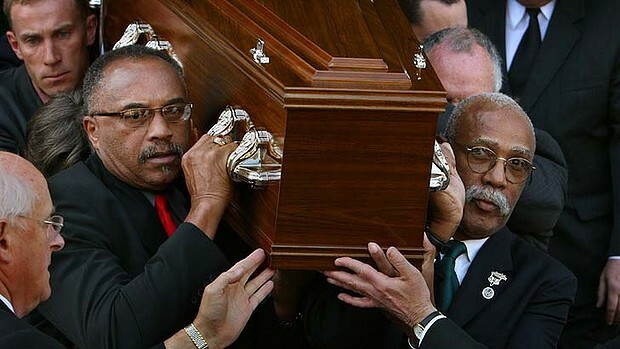 The picture of the African Americans carrying the coffin brought a tear to my eye. I wish the artist who created the statue with missing Peter could authorise a replica to be situated in Canberra, our nation’s capital, to honour the memory of his fighting spirit. Yes. It’s a brilliant concept. He hasn’t been forgotten. There’s a lot of street art in the inner west that incorporates that image. I don’t agree with the statement that “whites were simply aghast ..” I was 13 in 1968 and I was horrified about what was going on in the US with segregation. The sad part is how far removed we were from it in Australia. At the same time many of us were feeling empathy for African Americans by following assassinations in the news, and rushing to see Sidney Poitier movies, many of us who lived in the cities were largely kept in the dark about what was happening to the Aborigines. Most of us had never met an Aborigine. We were totally colonized by the sanitized version of history being taught here back in those days. I was taught in primary school that Aborigines were savages running naked in the Australian desert somewhere. We were taught that Britain was the “mother country” and our national anthem was “God Save the Queen”. We understood the struggle in America because it was always in the news but we talked about it all being “over there”. We might have been “engaged in our own segregation” but it was largely by stealth and our geographic isolation from the rest of the world. We saw the Vietnam War on black and white TV and it was never discussed in our classrooms at the time. We understood the issues. In man ways, the Peter Normans of Australia taught many of us how to stand up for what we believed instead of conforming to our own ignorance. Every country still has its rednecks. Please don’t put every white person in that category. As an Australian, I am saddened that for all of its goodness, our nation has a tendency to cut down its high achievers. Quite apart from the nobility of Norman’s courage, he was the highest achieving male sprinter the country has known and it unfairly prevented him from competing at Munich. That’s a shameful thing, exceeded only by its treatment of its original inhabitants and migrants not of Anglo Saxon ethnicity. Yes, the ‘apartheid’ word left me aghast in relation to Australia, but in reality we did have apartheid but it was hidden in government policies of segregation. Apartheid is a word that entered the English lexicon via South Africa. It is usually mostly associated with South Africa; however, we had South Africans working here in government roles from the early 20th Century. The notorious Mr AO Neville (Mr Devil) portrayed by British actor, Kenneth Brannagh, in the film “Rabbit Proof Fence” was a real person who was imported from South Africa in the 1930s to be “Chief Protector of Aborigines”. We did have apartheid but most of us didn’t know it as that because if it was mentioned at all it was called “segregation”. He definitely needs to be remembered in Australia. How about just adding one of those plaques alongside the sculpture to explain the artist’s concept, which invites people of all nations who visit there to stand with Peter? Would an Aboriginal Australian think about the country in the same way you do? Chances are the reason you haven’t heard the country described with words like Apartheid is because the describing is done by white people. Are you speaking about the country that described it’s native population as part of the flora and fauna? Thanks for letting us know. In fact in the original Italian version it was included. Unfortunately it escaped our notice. Thank you again. It wasn’t his fight but joined them in their fight. That takes more courage in my opinion. You obviously can’t see that. It doesn’t seem to me that boujisboo is suggesting he wasn’t heroic. Just that calling him the *biggest* hero is inappropriate. Why not “a forgotten hero?” “Also a hero?” No, he must be the best, biggest, most hero. I’m sorry you can’t see the problem with calling the white guy standing by in an action led by black people “the biggest hero of that night.” Especially in a story about anti-racism. I did not mean to lump all white people into a category, however Australia is a white country, and it is they who ostracised him..
What exactly has to be approved??? Ignore for a moment the racist slur; you write off an Olympic silver medalist in terms you find to be satisfactorily derogatory? “GRIOT – Sharing. Inspiring. Spreading culture” Really?? Fabulous idea, the plaque, and empty podium for individuals to stand up on, and reflect! I have one rule, when I publish a piece: let it go, never answer to the comments, everyone can have its own idea about what I wrote. But my article about Peter Norman had an enormous, incredible number of sharin’worldwide, so I think it’s right for me to crearly explain two things for which some readers criticized me. hero of this story, I’m not looking at the color of his skin: he could be white, black, yellow or a man from the moon, it’s not the real Matter. My piece, this story, it’s about choices. Norman decided in just one moment, and his decision changed and, in some way, destroyed his life. The most impressive think in this story, for me, it’s not about that night but about the silent strengthness he had to never make one step down. My piece is not about who was “more heroic”. This is not a competition beetween Smith, Carlos and Norman. They ran one against other only in that night of 1968, after they ran together. My piece is not about black or white, it’s about humanity and strongess and loyalty. And they have no color. Some people from England wrote me, angry because I used the expression “simpering englishmen”. Yes, I used it! I used to explain another kind of stereotiph, a stupid semplification even I was doin’, when I was younger and I looked at that photo, keepin’ my eyes to those beautiful, strong black men and don’t lookin’ at the white man. My eyes, like the eyes of all the world, they were taken by those fist up in the air and I didn’t even notice the color of the uniform, green, insted of the white english uniform. That expression tried to explain how wrong we all can be just takin’ a look at a photo and judge without think. May be in the Italian version my ironic tone was more clear. Sorry for my bad English. asked not to be added, so that people could stand there in solidarity. I’m not sure if it’s true or not, but it makes sense. And you are not I am guessing. I am classified as “white”, and I wouldn’t say that. I’m pretty sure you can find people classified as “black” saying the same. In that case you would say they are alienated or self-hating. What does it mater if Mike is white or not? The point is that he stood up for something he didn’t even have to stand up for, and by no means was his fight. But he realized it was wrong, and stood up against it. I’m so sick of people being defined by their color. You can be sky blue pink with purple polka dots, if you are a respectable human being, you should be treated as such. A plaque to the second place podium, and Norman’s statue in front, so that whoever stands in his stead, looks at him, never forgetting, while commemorating the two champions besides. Did you read the article? The world is not confined to our United States borders. You may be comforted to know that when filmsforaction.org reprinted the article, they changed “the biggest hero” to “the third hero”. This was “to more accurately reflect our own editorial views.” They still couldn’t spell “amateur”, though. The writer clearly has no idea of what Australia was like in 1968, but as an Italian who has most likely never been here, he may be excused. In contrast to yourself! Good article, and impressed with what he did – good on him. But Id like to know if the author considers William Wilberforce a ‘simpering Englishman’. That short of bs spoils it. The framing of this article is really not ok. I’m pretty sure you should you should apologize by taking it down. “Sometimes photographs deceive”??? It’s totally ok to tell the story of the third man in this photograph but not ok whatsoever to call him more of a hero. This is racist. Excellent article about a courageous stand against racism. What a shame the author had to spoil it with a racist/homophobic comment about how he thought Norman was just “a simpering Englishman”. Okay everybody, don’t forget, slavery was BAD! America was BAD! Everybody got it? Or should we reflect some more? Fascinating article. Not sure the line about assuming Norman was just a ‘simpering Englishman’ is quite in the peace, love and anti-prejudice spirit so well exemplified by this unsung hero. why wasn’t it his fight??? is fight against racism not fight of all of us? or do you only fight oppression if it hurts you but if it benefits you – you embrace it. an correction is in order here, Australia was never an Apartheid state let alone worse than South Africa. Sure Australia had problems with racism but to say it was a Apartheid state worse than south African is disingenuous and inaccurate. “the biggest hero of the night”? I’m a black man and I couldn’t agree with you more. I was only 5 years old at the time and could only remember the iconic pose on the podium, but it still sends chills up my spine and I’m very proud of all three of the men for their stance on human rights! By the way, I am a San Jose State alumi!